I have been so inspired by all of the riding, errandeuring, blogging, and tweeting going on this past almost-fortnight (I like to refer to things like a major tennis tournament). While I have not been writing as much these days, I have been immersed in perusing as much Errandonnee activity as I can. Today’s post features another blog roundup from the great errandeurs I’ve come to know through this challenge. Longer Baca continues her Accidental Errandeur quest with outings 9, 10, and 11. In other related news she’s looking for a good touring bike for a person of shorter stature so if you have any knowledge in this area, please let her know! Biking Yogini of Arlington, Virginia, snuck in an entire Errandonnee while I was not looking. Guess what was her first errand? A yoga class, of course! Bike Style Spokane made the challenge work for her by mixing it up with this activity I’ve heard about called “walking.” She also rode the minimum distance required and stayed true to one of the primary tenets of the Errandonnee– human-powered transportation. Up in New York state, Robert Kerner talks about how his lycra-centric wardrobe may not be best-suited for utility cycling, and he also makes the great observation that nothing starts a conversation like riding your bike. Me and the Mundo laments that he did not make it to the library, but he went a lot of other places during the challenge. Find out where here. Oh, and check out this very cool bike he photographed while visiting Crankenstein. In another example of errandeuring in challenging weather, JChernekoff reminds me that I have no right to whine about the D.C. temps. Also, be sure to check out her beautiful Independent! Simply gorgeous! Meanwhile in Oregon, the Ultimate Coffeeneur Bill A. completes his “Hitchcock-esque” Errandonnee photo set. You know you want to see it. Rootchopper has an even newer title, El Gran Errando. A Spanish errandeur recommended that he change his name from Errando Grande to El Gran Errando, as it sounded more noble. And despite his herky jerky start to the challenge and a brief period of quitting, El Gran Errando crosses the finish line like it was no sweat. An errandeur in Montana? Yes! Two, in fact. Manskerupcycled braved winter weather, road harassment, and so did her kiddo for eight of her 12 errands (honorable mention!). I love the ski goggles in these photos. My dad used to use those when running through the Iowa winters. Windy Run completes his last errands with a tour through Clarendon, and provides a great history lesson along the way. One of the errandeurs representing the Seattle area, Family Ride makes utility cycling look like a great adventure (because it is a great adventure!). Kids, cargo bike, great photos, fun stops. This Errandonnee has been a trip to follow. In the honorable mention category, Town Mouse almost made her Errandonnee happen without even trying. Unfortunately, she lacked the documentation for an official finish, but the effort was solid. AND the first submission I’ve received from Scotland, too! Do you remember the post clarifying that observations do not have to be bike-related but should be related to the errand you’re doing? 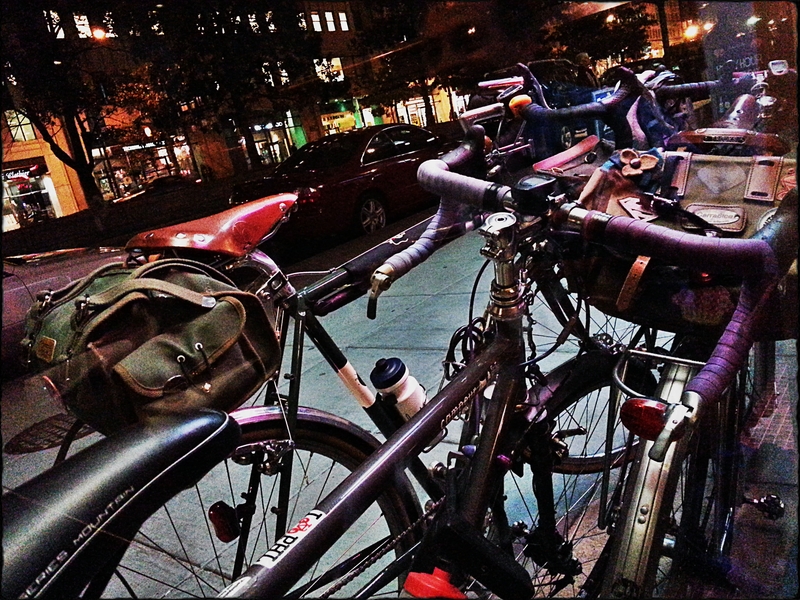 “For example, while it might be an important thing to learn about yourself, going to the bike shop and realizing that you will never be a dentist would most likely not meet the criteria of something you learned or observed on a bike shop errand.” PhysicsGirl on the Loose burned some brain cells linking her commute and her profession (which is not dentistry) to dentistry. Righteous creativity points! Tuckamoredew closes it out with a snowy trip to multiple errands. One stop included a reference to a Sherlock Holmes story an observation about a passed staircase. Are you sure there are 201 steps, Tuckamoredew? Tea? Community meeting? Rambling Rider makes it look effortless as she closes out her twelve errands. 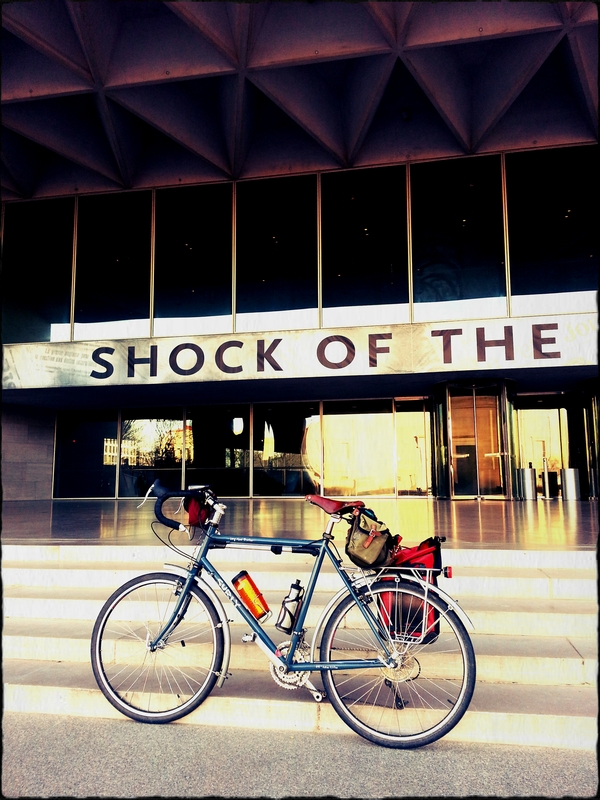 Southlakesmom, master of the strategic insertion of the bike helmet into photo, gives us a rundown of her Errandonnee trips and an observation that she did not mind completing the Errandonnee in a more forgiving climate like Northern Virginia. 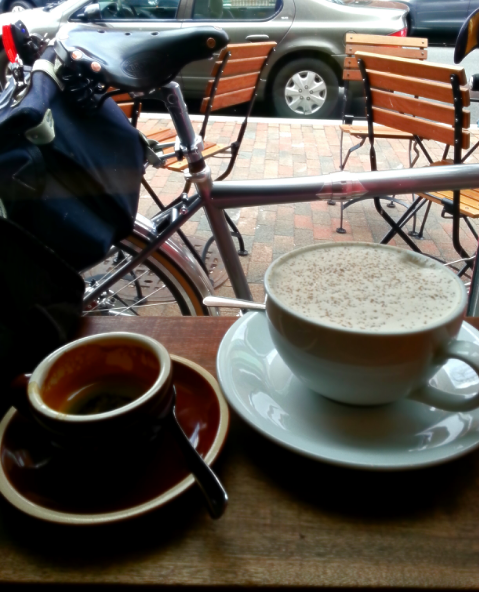 D.C.’s own Randomduck wants a special prize for riding the furthest for a cup of coffee. Does he win? I’m not sure yet, but he’s definitely on the podium. Clodhopper Rides, is an Iowa errandeur (first Iowa resident to participate in any of my challenges) who is down to the wire for Errandonnee completion. Did he make it before the Midwest blizzard hit? Stay tuned to find out! Bromptons make for good company and great errandeuring, as the Brompton Diaries proves with her successful two-day Errandonnee completion. The grocery store, the pub, the restaurant. The Brompton tucks in nicely almost anywhere. And unlike a pet, you don’t have to feed it! What’s better than a winter ride for ice cream? I’d say a summer ride for ice cream, although warm days make for difficult ice cream transport. Anniebikes works her way through the challenge in Vermont. That’s right. Vermont! It’s a little bit of everything on the blogs, and a whole lot of errandeur goodness. Thank you, bloggers and errandeurs! Errandonnee Business Note: If you completed the Errandonnee, be sure to send me your completed control card (electronic submission, and no signature required) via email at gersemalina “at” gmail.com. Please email me your final submission even if I have retweeted or blogged about you, as it is the only way for me to truly track who has completed the Errandonnee. I will confirm receipt of your submission via email. If you do not receive a response from me then I did not receive your original email. Entries accepted until February 28. Thanks, everybody! I better hop to it! DONE! Official email sent with links to blog posts. I hope its alright that my control card is a photo uploaded to the last one, if not I can send it separately as 2 photos or 1 PDF file with 2 pages. Congratulations on completing the Errandonnee! Nice posts and photos of the adventure… particularly like the mittens on the cow sculpture. Still waiting on the email so if you already sent it, would you please try again? Thanks! I only counted the steps once, but I was VERY careful. As I travel those stairs every week or so there will be future chances to confirm the number. I am still disappointed that I didn’t visit a bike shop to make said observation.